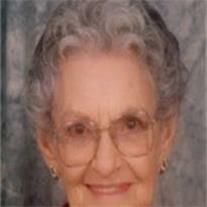 Lucille E. Dees Mate, 100, of Mesa, AZ, died April 11, 2013. Visitation is Monday, April 15, 2013 from 5-7 PM at Bunker’s Garden Chapel, 33 N. Centennial Way, Mesa, AZ. Lucille was born in Minco OK, December 13, 1912. She married Jack B. Dees in 1930 and was married to him until his death in 1973. She was married to Rodney Mate from 1978 until his death in 2007. Mrs.Mate moved to AZ in 1936, living many years in Scottsdale, Cottonwood, and the east valley. She is survived by her two daughters, Betty Dees Bendure, Juanita Dees Svendsen and their spouses, 10 grandchildren, and many great & great-great grandchildren. She was predeceased by her son, William L. Dees. She slipped into peaceful slumber surrounded by her family. Our special thanks to Home Instead & Hospice of the Valley for their care. In lieu of flowers, please make donations to East Valley Adult Resources (Mesa Senior Services).